Today’s story teller is an author [W:Anna Ogino]. In the story she wrote about her father who is unable to eat and the beautiful Japanese garden she saw. It’s called percutaneous endoscopic gastrostomy tube (PEG tube) and placed into a patient to feed semi-liquid food. It was really hard when she found that he couldn’t go on without the tube. She was relieved to hear his mind but still felt hesitation. The idea that “when one can’t take nutrition through mouth, it’s end of one’s natural term of existence” spurred her anguish. When she was having such hard time, she had a chance to visit a Japanese garden, where she was inspired by pine trees. 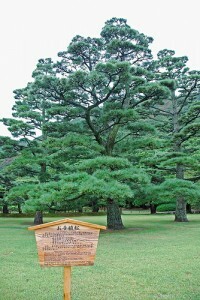 The garden is famous for old pine trees, and many of them have splints and some are patched band aid like sheets made of straws. To her, the long-living beautiful pine trees overlapped her father. Her hope now is to toast to her father with Champagne after he leave the hospital; although he will have it through the tube.